The Christmas Countdown is on! For crafters who enjoy making handmade gifts for loved ones, this can be a busy time of year. Quite often, we have the best of intentions to start our holiday crafting early, but sometimes, a last-minute craft crunch simply can't be avoided! Let the Woolery come to the rescue this year! We have plenty of thoughtful gift ideas which are quick to knit, crochet, and weave to keep everyone on your list happy! The popular Rikke Hat by Sarah Young is a simple, unisex beanie that knits up quick in DK weight yarn. It's available for free here on Ravelry! Washcloths are certainly useful gifts, but they aren't always fun to knit again and again. Megan Goodacre's Leafy Washcloth is a fun, free pattern you'll enjoy making each time! 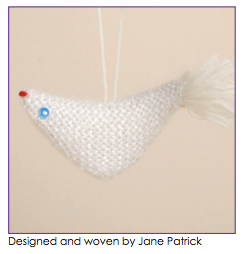 Click here for the free pattern on the Tricksy Knitter blog. A chunky-weight cowl will fly off the needles, and Jane Richmond's Marian is a mock-mobius which can be worn in a variety of ways. This design would look fabulous knit up in handspun yarn, too! It's available for free here on Ravelry. The Triangle Christmas Tree ornaments by Sarah Freeman are a cinch to make! Based on the traditional granny square motif, they will stitch up quickly and are great for detashing. Click here for links to the free pattern and video tutorial on the Ravelry pattern page. It's always good to have a few hats on hand for last-minute gift emergencies, and this unisex design is a great choice which is easy to customize. The Urban Slouchy Beanie is available for free here on the Little Things Blogged blog. Stripy Mitts by Sandra Paul are a colorful gift to make for the style maven on your list! 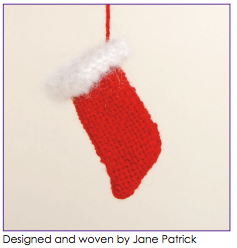 This pattern is available for free and is a great way to use up leftover yarns in your stash, too. When it comes to speedy weaving , Schacht's portable Zoom Loom is bar none. We have plenty of free patterns (courtesy of Schacht) to put those woven squares to work this year - click here to view them all! Below are a few of our favorite projects for woven tree ornaments which use just 1 or 2 Zoom Loom squares - click each image below to view pattern instructions! 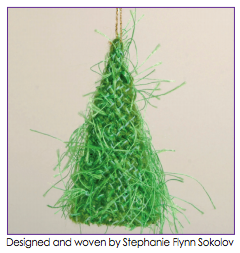 To add a festive touch, why not embellish your ornaments with sequins, beads, or needle-felted fiber designs? Let your creativity flow as you put your own unique touches on your Zoom Loom projects!